Alright, what were we doing in a produce warehouse in the middle of nowhere on a cool San Francisco evening? No, we weren't doing anything illegal and no merchandise exchanged hands. 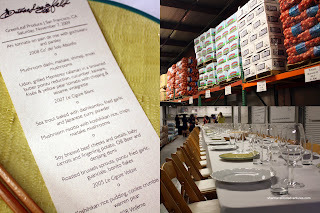 Rather, 250 food bloggers were bused from the Hotel Vitale over to Green Leaf Produce for our dinner and awards night. Yup, you heard me right. Dinner, awards, bags of onions and cabbage all-in-one venue. They weren't kidding when they said it was a warehouse. It really was. However, the smell and sounds from squid grilling and vegetables sauteing, put us in the mood. With the help of Outstanding in the Field, the warehouse was transformed into a really large banquet hall of tables snaking through the existing floor plan. The kitchen staff from Namu put together a Asian inspired meal for everyone to share alla famiglia style. Generally, the warehouse was quite dark and cold. I staked out a seat where there was ample light; but it was extra cold! You know me, I would do almost anything for better pictures! I was fortunate to be surrounded by such passionate foodies (mind you, weren't we all?) and we had great conversation all night. Among those sitting near and around me were Sophia, Maggie, Coco, Sabrina, Jared, Julie and Zoe. For once, I may have been more interested in the various conversations than the food. But honestly, we still dropped everything and stopped all discussion when any of the dishes arrived. We know what is most important... Anyways, we started out with a cold appetizer plate consisting of Kimchi, pickled broccoli, wax beans, leeks and seaweed. Despite looking like leftovers from a week ago, the broccoli was crisp. The tartness only helped us whet our appetites for the upcoming dishes. Our first course was the Mushroom Dashi with maitake, shimeji and enoki. Delicate, light and earthy, the broth was unfortunately cold. Chalk this up to a freezing environment and the large amount of guests. I bet it would've been even more fragrant if it was steaming hot. However, I did love the presentation in the wood bowls. Up next was the Udon & Grilled Monterey Calamari Salad. In addition to the udon and squid, there was cucumber, frisee, kaiware & yellow pear tomato. The squid was browned in a butter ponzu reduction and the salad was drizzled with chojang & sesame vinaigrette. The squid was prepared perfectly exhibiting a buttery soft texture while completely integrating with the ponzu. Most of us felt that the udon was unnecessary and actually detracted from the texture of the salad. The next dish was a bit of a curiosity. It was the Sea Trout baked with dashikombu, fried garlic and Japanese curry powder. We all know that trout and salmon belong to the same genera; but the main difference is that salmon spend most of its life in saltwater. A sea trout actually does much of the same and only returns to freshwater for spawning. That would probably explain that the dish looked and tasted somewhat like a salmon dish. I was pleasantly surprised that they did not overcook the fish; in fact, it was still rare in the middle - just how I like it! The addition of fried garlic really kicked the flavour quotient up a notch. We only wished there was more! Sophia ate the fried piece of seaweed underneath. I still don't know how she did it since it was quite tough to break apart. Actually I gave up trying to do so and just gave her the entire piece! After quite a long wait due to other tables getting their dishes, in the process bypassing our table, we finally got the Mushroom Risotto with koshihikari rice and crispy maitake. I liked the overall flavour of the dish since I love mushrooms, which give any dish a certain degree of earthiness. However, it was a bit goopy and didn't have the silky texture associated with risotto. Again, chalk this up to the fact they were trying to execute a very difficult dish for so many people. Now we get to the meat of the dinner, literally. Presented on a large platter, the bounty of Soy-Braised Pork Cheeks, Oxtail, baby carrots and fingerling potatoes was almost too much at this point of the meal. The pork cheeks were ever- so-tender while the shredded oxtail was both rich in texture and flavour. Moreover, it was nice to see that the root veggies were not overcooked. Last dish was probably the most surprising dish of all. I'm not really a big fan of brussel sprouts due to the fact they taste a bit funny and when overcooked, it can be some mushy business. However, the Roasted Brussel Sprouts with ponzu fried garlic, guanciale and bonito flakes changed my mind quickly. The sprouts themselves were roasted al dente so that there was still some bite left. Furthermore, the guanciale (or unsmoked Italian bacon) really put a mark on this dish by giving a saltiness that helped mask the "aroma" of the sprouts. To end the meal, we had Koshihikari Rice Pudding with cookie crumbles and Warren pear. The topping was pretty darn good; but that only hid the pretty average rice pudding. During that time, the Foodbuzz awards were announced. A pretty cool (no pun intended) evening with great company, good food and the Foodbuzz vibe! I staked out a seat where there was ample light; but it was extra cold! C'mon man, you are Canadian, you can take that cold better than them! If they are organizing this again next year, you bet I will be attending it! Actually it was pretty cold and I didn't wear a thick enough jacket. But at least I was distracted from the cold due to the company and the food.